Penetrating rust inhibitor - stops rust and protects the base metal from further rusting, penetrates and protects down to the sound metal, drives out moisture and air and stabilises. Leaves a bonding film on all surfaces - excellent adhesion to metal or wood. Maintains the natural look of the surface, enhanced adhesion, ideal foundation for primers or finishing coats, allows paint to be applied direct to firm rust, heat resistance up to +175°C. 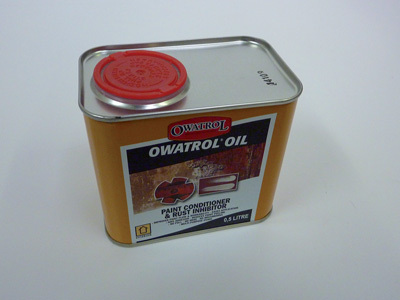 Penetrating rust inhibitor - stops rust and protects the base metal from further rusting, penetrates and protects down to the sound metal, drives out moisture and air and stabilises. Leaves a bonding film on all surfaces - excellent adhesion including on galva, alu, zinc, wood etc. Maintains the natural look of the surface (metal, wood, etc. ), enhanced adhesion, ideal foundation for primers or finishing coats, allows paint to be applied direct to firm rust, heat resistance up to +175°C. Paint Conditioner - makes alkyd paint rust inhibiting, improved paint flow and workability, better viscosity which allows painting to be carried out in cold, warm or windy conditions. Wood impregnation - deeply penetrates and seals wood.